Sterling Publishing (NY), 9781454929239, 240pp. 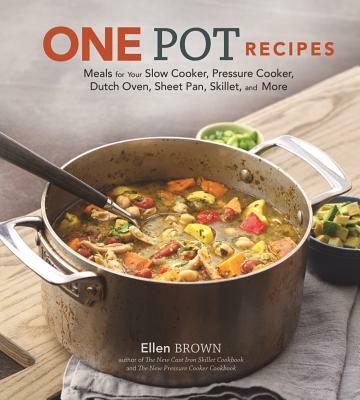 With more than 100 easy recipes to make in a range of pots, Ellen Brown gives busy cooks a variety of delicious options for getting complete meals on the table--with little fuss and minimal cleanup. The success of the Instant Pot makes it clear that home cooks want easy "one-pot" solutions to meal planning. This cookbook gives them just that, with recipes for flavorful, balanced meals that include a protein, vegetables, and usually a starch or legume. That means it takes only one recipe-- and one pot -- to get dinner on the table . . . and everything is ready at the same time. Recipes are divided according to the pot in which they're cooked, whether it's an Instant Pot, Dutch oven, slow cooker, or even a sheet pan or skillet.